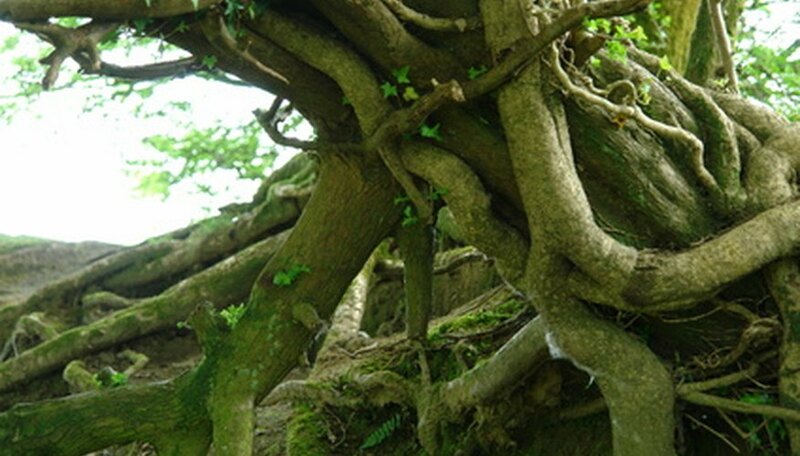 The root system of a tree is one of its most important elements, providing several vital functions. Roots store nutrients for the plant during the winter and transport water and minerals during the active part of the growing season. Roots also provide an anchor to the plant, keeping it from toppling during extreme weather conditions. Most tree roots, according to the Colorado State University Extension, are set at the first 6 to 24 inches of soil. The root system will generally be about two to four times the diameter of the tree crown. Most perennial tree roots grow horizontally out from the plant. Smaller feeder roots are 1/16 inch in diameter and make up the vast majority of the root ball under the tree. According to Iowa State University, some trees will grow striker roots in drier soil, which grow straight down. These usually do not penetrate deeper than 3 to 7 feet. Tree roots grow where the greatest amount of nutrients and water are available; at the soil surface. Tree root growth is also affected by soil compaction, which is the density of the soil and the soil temperature. Compacted soil is more dense the deeper down you go, and nutrients are not as abundant in compacted soil since water does not move freely through it. Root damage is caused by a variety of factors, but the main factor in the urban environment is soil compaction. Foot traffic, concrete and poor soil preparation when planting the tree causes compaction. Since minerals are not as available in compacted soil, roots die off. Soil removal around the tree, exposing tree roots, also causes injury. Watering too much or too little and poor fertilization practices damage roots as well. Root diseases also affect the life of the plant. Two types of fungi cause damage to feeder roots and the large, woody roots. Phytophthora, pythium and fusarium break down feeder roots, causing the foliage of the tree to wilt, change color and die. Serious fungal infection will infect the vascular system of the tree roots and cause the plant to die off completely. Fungi also reduces the tree's immune system, making it susceptible to other disease. Keeping tree roots healthy prevents infection with fungi. Keeping the soil moist and free of compaction down to a depth of 24 inches keeps the roots healthy and resistant. Established trees require a fertilizer application once a year in the spring after the leaves have expanded.